PARACHUTE PURE COCONUT HAIR OIL is one of the oldest and the most popular hair oils n India. This has been used since years by our grandparents, parents and now by us. I have always seen at least one bottle of this PARACHUTE HAIR OIL in my home at some point or the other. Normally there is one in each specially in winters when this miracle hair oil is not only used on hair but also on skin because of its nourishing and moisturizing properties. I remember once when I was suffering from BODY ITCHING in winters, my family doctor told me to apply PURE COCONUT OIL all over the body after bath on damp skin and since then I started using it on my skin as well in winters and never suffered from itching after that. This time again while using this wonderful 100% PURE COCONUT OIL on my skin and hair, I though of reviewing this. WHAT PARACHUTE PURE COCONUT OIL CLAIMS? Dryness of scalp is a common problem faced by us today. As the name suggests, the product is pure and herbal. With adulteration these days, it is difficult to find a 100% pure product, but Parachute oil is an exception. Parachute 100% Pure Coconut Oil nourishes the hair and improves its texture like no other. The best part of this is its dual use. This oil is every chef's choice for healthy and tasty cooking. The flavor is amazing, supplying you both delectable crunches and health. Taste and health, a rare combination is Parachute's forte! The oil is available in easy to use plastic bottles and has substantial life when stored properly. It has been scientifically filtered to remain fresh for a long time. The quality is maintained owing to the method of extraction: it is made by pressing sun-dried coconut kernels in an oil mill before micro-filtering. Parachute 100% Pure Coconut Oil is low in fat, contains no cholesterol and is the best base for cooking. Grab a bottle of this amazing liquid to enrich your culinary experience; also, do not forget it is good for the hair too. Perfect ancient remedy for hair problems like Hair fall Hair loss Split ends Weak hair root Hair moisturizer & conditioner Stops hair fall and promote hair growth One of the oldest ancient ways to keep your hairs healthy Millions of people have already used parachute and are still using it. Patanjali Coconut Hair Oil Review. How Often Should You Oil Hair? It can also be used for body massage and other uses. Price - Rs 14/- for 38ml. This PURE COCONUT OIL comes in a very familiar looking blue bottle with flip cap. The oil is available in so many sizes from 38ml to 500ml and one could easily buy according to the convenience. The flip is also very user friendly easy to open, yet very tight does not leak any drops of oil even if the bottle is left upside down. The oil is very light like most of PARACHUTE HAIR OILS. This is the best part because most of us really stay away from oil because they are really away and make hair look very greasy specially CASTOR Oil-Best Oil for Hair Growth. But this is not the case with this hair oil. Its very light and does not weigh down the hair at all. the fragrance of this is again very soothing. Some people might not like it but I personally like it very much. I feel if some coconut is being heated on smelling it and is not at all strong or irritating. Now coming to its effectiveness in improving hair texture, reducing HAIR FALL, SPLIT ENDS, DRYNESS, ROUGHNESS, etc. I have been using this COCONUT OIL since years, mostly in winters. I normally use it thrice in a week in winter season since my hair feel extremely dry and rough at this time. But thank God, I have this oil as a savior. I apply this oil mostly at night before sleep and leave it overnight and than shampoo the next day. Sometimes, I even apply this few hours before shampoo since this way my don't feel dry or rough after shampoo but very smooth, manageable and free of tangles. Otherwise my hair is difficult to manage in winters because they feel so dry and full of tangles that I have to use a sufficient amount of a leave in conditioner, which actually makes my hair weigh down and look greasy. To avoid this problem in winters, I keep using this Parachute oil, once in every days and the result id smooth, shiny hair full of life and free of tangles. I am using the word full of life because they look more bright and shinier and very easy to comb. This is something I really like about this oil very much since it gives a perfect solution to my DRY ROUGH TANGLED HAIR, that too without the use of any chemical product. Along with this, I also use this on my damp skin which get me rid of skin dryness and itching without doing any harm on my sensitive skin. So all in all I love this PARACHUTE COCONUT HAIR OIL. I use it on my hair and on my skin as well. It definitely helps in improving hair texture on using it regularly. It makes hair appear more shiny and full of life along with reducing hair fall. I have personally felt a huge REDUCTION IN HAIRFALL at some point of time. I do suffer from SPLIT ENDS, but haven't seen any change in SPLIT ENDS reduction so far. So I definitely recommend this wonderful oil to everyone suffering from any kind of hair problem, since you have nothing to loose even if you don't benefit from this. Pure Coconut oil as claimed. Makes hair smooth and tangle free. Improves hair shine and texture. Reduces hair fall with regular application. Available in so many sizes. Easily available offline & online. Best Oil to reduce itching and dryness in winters. Travel friendly bottle with flip. Labels: Parachute, Parachute Coconut Oil Review, Parachute Hair Oil Review, Pure Coconut Hair Oil. 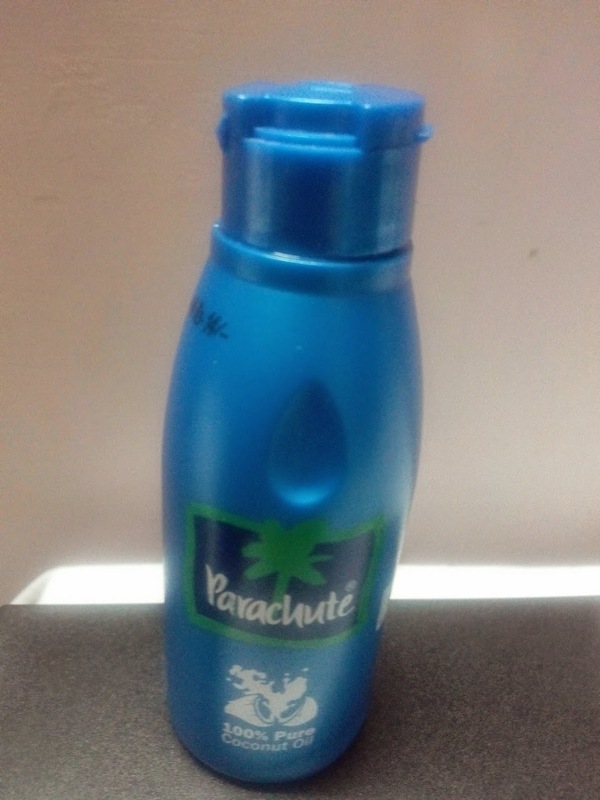 Parachute is a great brand, since my childhood I am applying its oil. Now my sister is having hair fall problem I have suggested her to use Parachute Hair Fall Therapy, she is happy as her hair fall problem has been decreased. Combination of coconut oil with henna with methi as a hair pack and help to cure baldness...since its a natural process its gonna take time but will give effective results!! I really enjoyed reading your best review on Parachute Coconut oil. Thanks so much and keep adding more I interesting posts. It is in solid form so you have to heat it by microwave or other. I don't know if you can cook with it or not. I use it for hair repair. Hey where can I get this? as per below note, is mean that this type of coconut oil also can use for cooking? "Parachute 100% Pure Coconut Oil is low in fat, contains no cholesterol and is the best base for cooking."